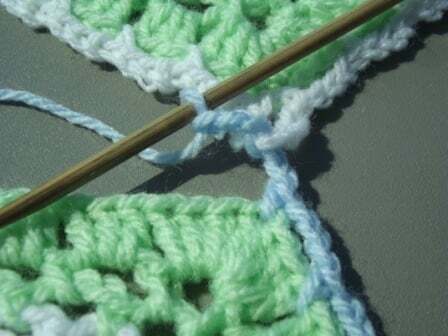 This page shows how to join the second square to the first square. 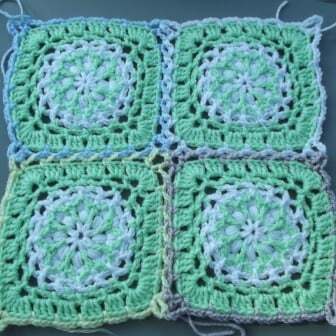 The second square is worked the same as the first square along the first two sides. Then you join the third side to the first square from corner to corner. 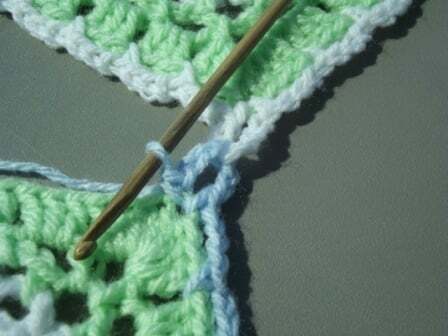 The last side is then worked the same as the first square. As with the first square, the number of chains may vary from pattern to pattern. 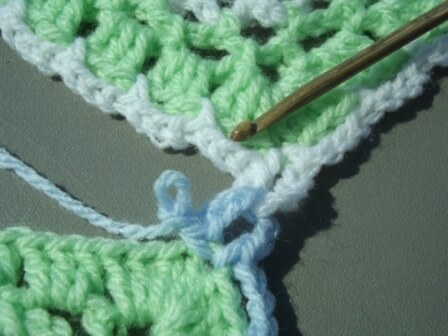 However, you still need to have the same amount of chains in each loop as in the first square. The only difference is that the number of chains are broken up on the second square. So for the chain-5 loop, you basically make 2 chains as normal, drop the loop and pick it up from the corner loop. Chain 1 to secure and then make another two chains for a total of five. For the chain-3 loop you chain 1, secure, and chain another for a total of 3. 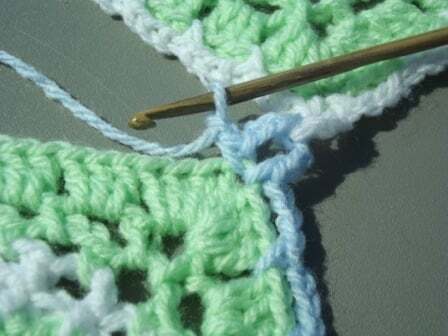 Join yarn to any corner of the second square and crochet along the first 2 sides the same way as you did for the first square. 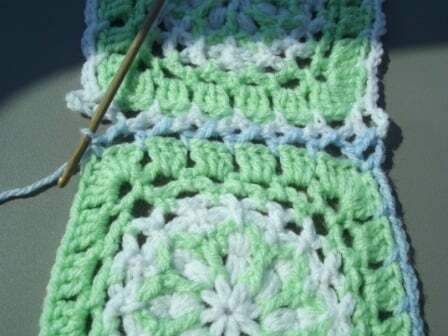 The third side is then joined to any side on the first square starting at one corner and joining the two pieces from corner to corner. 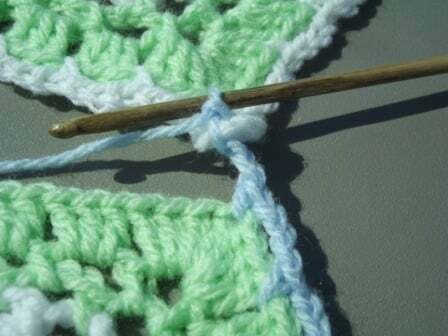 To begin, make sure you have your single crochet in the corner stitch, space or loop. Make a chain 2 and drop the loop. 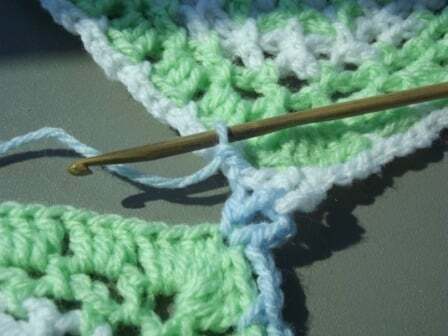 Then insert your hook into the corresponding corner loop making sure to go in from the top. Pick up the loop and pull it through the corner loop. Chain 1 to secure the two loops. 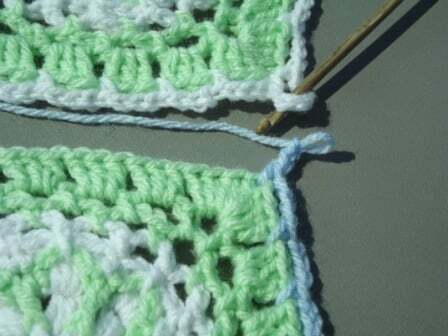 Make another 2 chains for a total of 5 – the same amount as the corner on the first square. 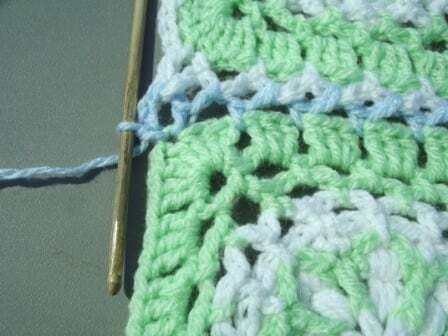 Single crochet once more into the same corner stitch, space or loop of current square to finish the corner loop. 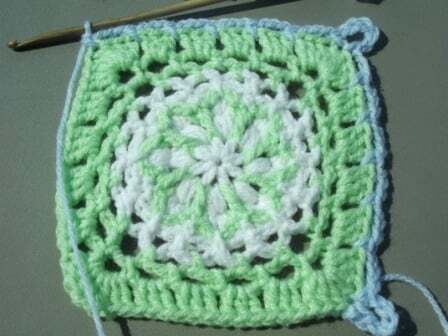 Drop the loop and insert your hook in next ch-3 loop on completed square. Again, make sure to go in from the top to bottom. Pick up the dropped loop and pull it through the loop of completed square. Once again, chain 1 to secure the 2 loops. 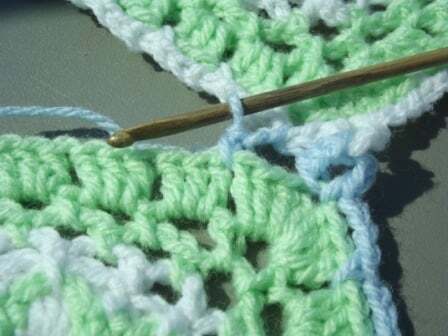 Single crochet back into the current square. Repeat Steps 7 to 12 across to next corner. 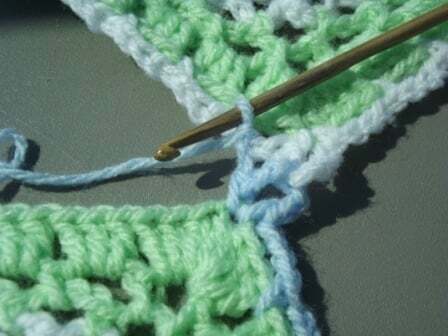 Then repeat Steps 2 to 6 for the second corner. 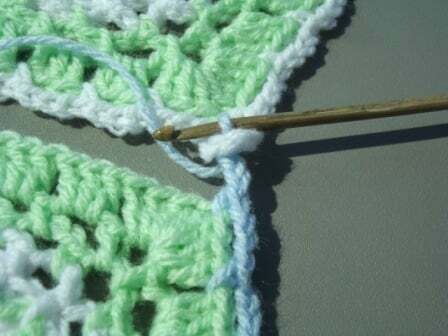 Continue to crochet along the last edge. 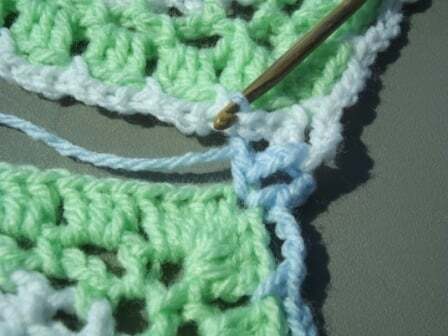 Join the last chain to the first single crochet and fasten off.